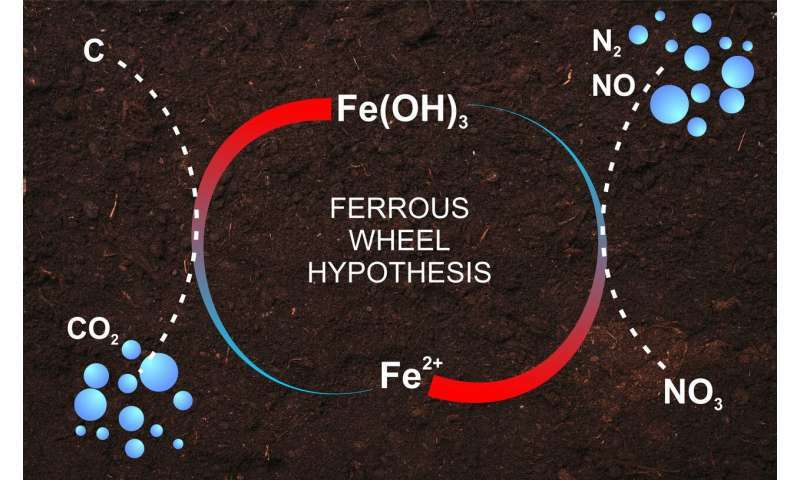 A team of agrochemists from Russia, Germany, and Chile confirmed the so-called ferrous wheel hypothesis—the turnover of iron in the soil that enriches it with organic nitrogen. The results of the study were published in the Geochimica et Cosmochimica Acta journal. The soils of rainforests in south Chile are rich in organic and inorganic nitrogen (N). Despite heavy precipitation (over 5,000 mm a year), practically no inorganic nitrogen (that is often a part of the NO3 group) is eluted from the soil. One theory that explains this phenomenon is called the ferrous wheel hypothesis. According to it, the iron in the soil turns NO3 into NO2 that reacts with organic substances. This is how nitrogen moves from inorganic to organic compounds. The ferrous wheel hypothesis was suggested in 2003, but no reliable experimental proof has been provided since then making the scientific community doubt the theory. A RUDN agrochemist together with his colleagues from Chile and Germany were the first to prove it right. To do so, they used a new technology: an automated device for taking an inorganic nitrogen sample (SPIN) and a quadrupole mass spectrometer. The team prepared three soil samples—with high and low iron content and without iron at all. Each sample was placed in the mass spectrometer and treated with an alternating electrical field. Under its influence charged particles (ions) with different masses and charges emerged from the sample. Using the trajectories of each ion, the team calculated the ratio between its mass and charge and therefore the initial atomic composition of the sample. The measurements were taken 15 minutes, 1 hour, 24 hours, and 5 days after adding iron. To trace the path of nitrogen from inorganic to organic substances, the authors marked the atoms in NO3 using nitrogen isotopes 15N – the atoms with one additional neutron in the nucleus compared to "regular" nitrogen 14N. These isotopes have identical chemical properties, but it is easy to differentiate them using a mass spectrometer. Thus the agrochemists were able to trace the movement of nitrogen between soil substances. Within 15 minutes after adding iron the volume of NO3 reduced by 20% in the sample with low iron content and by 35% in the one with high iron content. It took the same time for the concentration of dissolved organic nitrogen to increase from 0 mg per liter to 0.08. In 5 days the concentration doubled. The same processes took place in the sample with lower iron content, but at slower speed. As for the control sample that contained no iron, no turning of NO3 into organic nitrogen was registered in it. "Our results clearly confirm the hypothesis about the transition of NO3 into dissolved organic nitrogen. The ferrous wheel hypothesis partially explains the preservation of NO3 in the soils of rainforests. This study became possible only because of the availability of the new technology that provided for accurate analysis of iron and NO3 content in the soil without any distortions," said Yakov Kuzyakov, a co-author of the work, a Ph.D. in Biology, and a staff member of RUDN. In the future the team plans to carry out similar studies for other types of soils to which the ferrous wheel hypothesis also applies. The authors emphasize that the experiment was carried out in the laboratory and has to be reproduced in a natural ecosystem. The participants of the study also represented the University of La Frontera (Chile) and the University of Goettingen (Germany).